When making samples for Leadership, we received all the Sale-a-bration stamp sets, but we also received the Oh Hello set. I love this set and was so excited to make a few projects with this stamp set. The first Oh Hello sample I have to show you today is a little envelope. 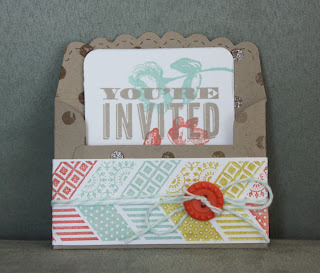 I stamped and embossed the whole envelope with the Distressed Dots background stamp. The little card inserted into the envelop could be used to invite someone to a party or shower. I used the stampamajig to line up the arrow stamp. I tied Pool Party Bakers Twine around the whole envelope and finished it off with the Tangerine Tango button form the Sycamore Street Ribbon & Button pack. 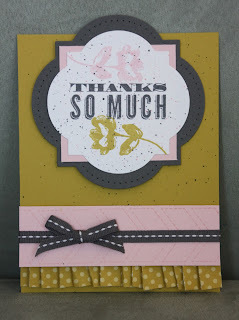 The second sample today is card, again using the Oh Hello stamp set. The color combo on this card is Basic Grey, Summer Starfruit, Pink Pirouette & Whisper White.